Paul Pouliot of the Pennacook Abenaki People reads a statement from Pessamit Innu First Nation Chief Rene Simon to the Site Evaluation Committee Thursday during a public comment session on Northern Pass. Several members of the Innu people stand with Pouliot. CONCORD — The Northern Pass Transmission project was described as a potential scar on New Hampshire’s face to solve a self-induced energy crisis for southern New England. More than 40 people spoke Thursday during a three-hour comment session before the Site Evaluation Committee, which is expected to decide the $1.6 billion, 192-mile, high-voltage transmission project by the end of September. Many project opponents urged the committee to “do the right thing” and turn down the project saying it would irreversibly change the state’s landscape, heritage and way of life. The few project supporters at the hearing, including the state’s largest employer, BAE Systems of Nashua, said the project would help drive down and stabilize electric rates that are some of the highest in the country while providing renewable energy. Bailey presented the committee with a list of 50 businesses from across the state in many industries and sizes supporting the project. However other business owners turned out to oppose Northern Pass particularly those along the 50-mile section of buried line from Bethlehem to Bridgewater. The owner of Polly’s Pancake House in Sugar Hill, Kathie Aldrich Cote, said two summer construction seasons for the project will have a tremendous negative impact on her 79-year-old business. With the slowdown, she may have to lay off employees, she said, and would hurt her vendors. Cote gave the committee letters from 75 other area business owners lamenting the project’s impact on their livelihood, with some saying they may not survive the disruption. Lawmakers also turned out to protest Northern Pass and presented a petition signed by 100 House and Senate members. Another project opponent, Melissa Elander of Easton gave the committee boxes holding petitions from more than 20,000 people in opposition to Northern Pass. The opposition was not only to the project and its developer Eversource, but also to its partner Hydro-Quebec which will supply the electricity. 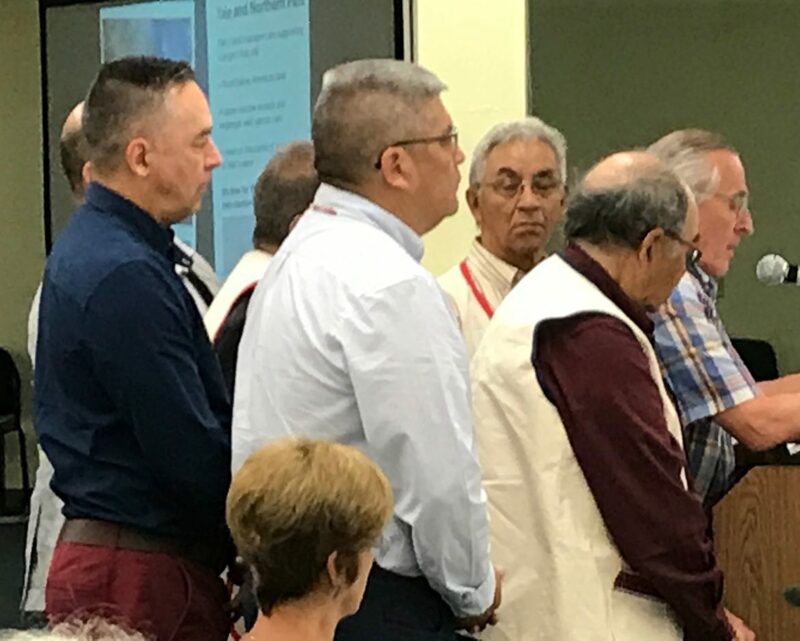 Several members of the Pessamit Innu First Nation, whose land was taken to construct several large scale dam facilities to produce the electricity, appeared before the committee. Paul Pouliot of Alton, a member of the Cowasuck Band of the Pennacook Abenaki People, spoke for the group reading a statement from Innu chief Rene Simon. He said the supreme court of Canada recognized their ancestral rights to their land that Hydro-Quebec had invaded between 1952 and 1978, building 13 hydro-electric plants and 11 reservoirs. Pouliot said the company owned by the Province of Quebec created an environmental disaster. And he said the dams greatly reduced the salmon the Innu depend on for food. “Should we be enabling Hydro-Quebec in its act of genocide against them,” Pouliot asked. Lynn St. Laurent of Hydro-Quebec said her organization has working relationships with the native community on other projects all over the province with 30 agreements. “Hydro-Quebec strictly abides by the operating rules of generating stations on the Betsiamites which were drawn up in collaboration with and approved by the community of Pessamit,” she said. St. Laurent said Hydro-Quebec worked with the Pessamit to restore salmon in the river with impressive results but the agreement ended in 2007. Many opponents of Northern Pass claimed the hydro produced electricity may be renewable energy, but not clean energy. Pamela Martin of Plymouth noted the state does not have a definition of clean energy but does for renewable energy and large scale hydro does not qualify. But supporters said something has to be done to bring down the cost of energy in New England if the area wants to remain competitive. Energy broker Tad Dziemian of East Hampstead said he supports the project without question. “I get first-hand feedback, mostly complaints from my clients about the high cost of electricity,” he said, adding all six New England states are among the 10 most expensive in the country. He predicted New England will experience double-digit rate increases because many generating facilities are shutting down. While opponents asked the committee to do the right thing and turn down the project, Bailey asked the regulators for a thorough and fair process to reach a decision in a timely manner. He noted BAE and other businesses were denied intervenor status with SEC saying their views would be represented by the Counsel for the Public, but that has not been the case. But project opponent Mark McCulloch of North Stratford said if businesses want cheaper electricity they can do what he did – install solar panels which account for 70 percent of the electricity he uses in his home and business. He noted Northern Pass has been going on for seven years and has taken a toll on the people affected by the project. Hearings on the 1,090 megawatt transmission project to bring Hydo-Quebec electricity to New England continue Friday.